The struggle is real especially for folks battling misophonia. I live with two misophonians! I learned how to thrive not just survive with my husband (of 28 years) and my daughter. Both have misophonia. Check out my previous post to learn more about our happy household by reading Fast and Easy Ways to Annoy People with Misophonia. Accept the disorder is real. Quit thinking your loved one(s) are just being rude, spoiled or obnoxious. Write down a list of triggers together. If you are just getting acquainted with the fact your loved one(s) has misophonia, knowing the triggers are very IMPORTANT! Avoid known triggers at all costs. Memorize them if necessary. Don't pressure your loved one(s) to attend social functions. Social interaction is especially annoying with all kinds of sounds and noises. Be aware that your misophone is hearing repeated noises that you may hear but ignore. They cannot ignore the noise! If you notice someone triggering your loved one, ask them "Have you met Miso?" You can introduce people to the disorder without embarrassing anyone using this lead-in. Most people are interested in knowing more about misophonia. You are not a failure if you commit a trigger sending your misophone into orbit. Over time, you will learn to never trigger them. Their disorder will become secondhand to you, almost like you have the disorder yourself. Consider misophonia while grocery shopping. Leave the crunchy, slurpy, noisy food on the shelf. Hang in there. I have noticed my husband's miso has gotten better with age. He can control it better. He also gives us a hint if we are triggering him. He simply says "miso, miso, miso". We know to stop, inventory what we're doing related to repetitive sound and quit doing it. 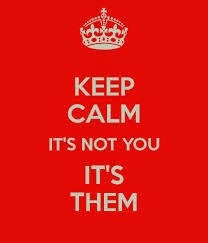 Keep calm and remember "It's not you, it's them!". Living with someone with misophonia can be hurtful at times for either or both parties. True compassion is your best weapon against the noise monsters. Leave me a comment with tips you've learned living with misophonia. Let's help each other.